The North-West Frontier was notoriously unstable. The British both admired and feared what they characterised as the 'martial races' who lived in the unforgiving mountains there. Unfortunately for the British, these hill tribes were highly independent and difficult to subdue. Although their independent spirit often prevented them from combining to form a more sustained threat to British India. However in 1897, a succession of tribal uprisings occured to create a more sustained threat to the North West Frontier. The uprising started in the Swat valley under the nominal guidance of a holy man who would be referred to by the British as the Mad Mullah. Successes in that valley spread his credibility to other neighbouring regions and tribes. He claimed that the British were seeking to extend Christianity into the area and that they had lost control of Aden and the Suez Canal. He therefore could claim that no reinforcements were going to arrive other than those soldiers already on the ground. The Tirah Expedition was organised as a response to this threat to British Imperial prestige and the approaches to British India. Their nominal target was the Afridi and Orakzai tribesmen who had moved South of the Khyber Pass. However, the real objective was to reassert British control definitively in the area and to deter tribesmen from probing yet further into Northern India. The government had to be seen to take this issue seriously and so raised an impressively sized Field Force consisting of upto 40,000 soldiers and over 60,000 transport animals. The commanding officer was to be Lt-General Sir William Lockhart. 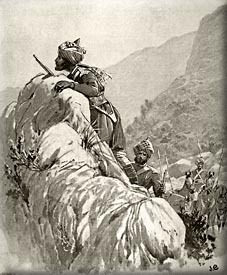 The expedition was to invade Tirah from Kohat via the Sampagha and Arhanga passes whilst being supported by flanking columns from Peshawar and the Kurram. But, before the main column could really get going, it was decided that they needed to clear local people from villages along an area of high ground overlooking the road known as the Dargai Heights. These settlements were over 6,000 feet above sea level and were only approachable by climbing sheer cliffs or by taking a narrow track whose entrance could only be approached over open ground. On the 18th of October, the 2nd King's Own Scottish Borderers and the 1st Battalion of the 3rd Gurkhas quickly ascended the heights receiving light fire from enemy tribesmen. Despite the harsh terrain, the British forces only sustained two deaths and thirteen wounded soldiers and occupied the heights quickly and efficiently. The objective seemed to have been taken at relatively little cost. The commander though felt it prudent to withdraw these forces as they were felt to be too isolated and would be difficult to supply, water supply was a critical issue in particular. Lockhart also felt that the presence of the British forces at Dargai would reveal his intended route of march. So the forces vacated the heights. When the main British column began to move out from Kohat on the 20th of October, they found that the heights had not only been reoccupied, but reoccupied by a considerable force of over 12,000 tribesmen. The same heights were going to have to be reassaulted but this time with a determined and large defending force waiting for them. Long range covering fire was provided by the Gordon Highlanders with support from a Maxim Gun detachment and various mountain batteries. This allowed the 2nd Gurkhas to prepare to advance over the open ground to reach the narrow ascending track. Just moving 100 yards cost them 3 officers and 50 men before they were pinned from the withering fire from the heights above. The Dorsets and the Derbyshires were deployed to try and rush the ridge but each lost between 40 and 50 men with their attempt. They were also to be pinned alongside the Gurkhas for some five hours in total. Next up was to be the Gordon Highlanders and the Sikhs to try and retake the initiative on the battlefield. After a concentrated artillery barrage, the Gordons dashed up the slope with pipes playing and guns blazing. The tribesmen did not wait to be on the receiving end of a Highland charge and so melted into the hills behind. The situation had been saved, but at considerable cost to all the units involved. There was to be much criticism of the initial decision to evacuate the heights on the 18th. It seemed as if the battle of Dargai Heights was an avoidable sacrifice. Five Victoria Crosses were awarded for the action, but the casualty list saw 4 officers killed, 34 enlisted men killed, 14 officers wounded and 147 enlisted men wounded. With the Dargai Heights safely under British control, the Field Force could advance with relatively limited resistance before the main column. By October 29th elements of the Queen's Regiment and the King's Own Scottish Borderers had taken the ridge overlooking the Sampagha Pass. Two days later the Arhanga Pass was secured. This allowed the British to begin taking punitive actions against the tribes beyond these passes. Villages were burnt, crops destroyed and weapons were confiscated whenever possible. It seemed as if the Field Force was achieving its objective. Despite the fact that the main column was making good headway, it was the baggage trains and foraging parties that were having a harder time. These and smaller groups of soldiers who had been broken up for the punitive actions against the tribesmen presented much more manageable targets for the tribesmen. These weaker targets could be on the receiving end of ambush, long-range fire and opportunistic raids at any time, day or night. 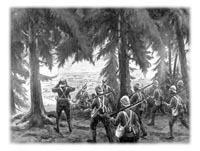 There was a constant stream of small scale skirmishes and if the British concentrated forces to deal with a suspected strong point, the tribesmen would disperse before the British could track them down. This was guerilla warfare in some of the world's most inhospitable terrian. To make matters worse, the tribesmen had acquired breech-loading rifles on a large scale for the first time on the frontier and so the ranges and effectiveness of the fire was more deadly than anything that the British had experienced before. Concentrations of troops had to be dispersed and mountain tactics re-evaluated and redefined. The constant skirmishes and ambushes could be deadly. On the 9th of November for example, a unit of Northamptons were separated from supporting Sikhs after burning some villages in an area known as Saran Sar. They received withering fire and it took the combined efforts of the Sikhs and Gurkhas to extricate the beleaguered force. Even then, the losses were substantial with two officers and eighteen men dead and a further four officers and forty-four men wounded. Two companies of Dorsets and Sikhs were ambushed one night whilst seeking straggling soldiers. They were separated from their main communications lines and had to withstand hand to hand combat from the Afridi tribesmen wishing to finish them off. The Dorsets lost all their officers and had to make a last stand in some burnt out houses under the command of the ranking sergeant. Despite being overwhelmed numerically, the sergeant kept order and allowed the remainder to make it to safety. Despite this, four officers and twenty-five men had been killed whilst six officers and thirty-eight men had been wounded. As the winter weather advanced, the force was drawn down and started to leave the area for the comfort of their normal frontier forts. The 3rd and 4th Brigades experienced deadly sniping and probing attacks as they attempted to withdraw back to the Bara Valley. Mud encrusted roads slowed the retreating army yet further and when, on the 11th of December, mist and fog descended on the troops, the Afridi tribesmen took advantage of the weather to launch a deadly and sustained series of attacks. It wasn't just the soldiers that had to respond, camp followers and supporting personnel all found themselves forced to man the perimeter of the columns or help evacuate the numerous casualties building up. The attacks continued during the night and it was only when the Afridis became aware of an advancing relief column from Peshawar that they began to leave the scene and allow the column to continue its journey back to relative safety. So far, the British attempt to subdue the tribesmen had had little long term effect. Repeated attempts to negotiate an end to the hostilities through Jirgahs with tribal elders came to very little. Towards the end of January a new attempt was made to force the Afridi tribe to negotiate an end to the constant warring. The British aimed to capture the bulk of the winter food supplies for the tribe, namely their remaining flocks of sheep on which they depended during the deep winter months. On the 19th of January, the 36th Sikhs and the Yorkshire Light Infantry advanced out of the security of Mamanai. Whilst advancing along one of the passes, it was felt to be prudent to control the high ground on either side. However at one point, there was a misunderstanding between the two units and the 36th Sikhs abandoned the heights to the West of the pass. Seeing an opportunity, the Afridis occupied the high ground and poured withering fire on the Yorkshire Light Infantry below. With great difficulty the unit extracted itself to the mouth of the pass thanks to help from a relief column. Unfortunately, they had had to abandon their dead and some of the badly wounded to the Afridis. Five officers and twenty eight men had been killed and a further three officers and thirty four men were wounded. Elsewhere, the British had been more successful in seizing at least some of the livestock of the Afridis. June of 1898 the Afridis agreed to hand over 800 breech-loading rifles and pay an indemnity of 50,000 rupees. Furthermore, the Afridis agreed not to negotiate or do deals with any other power than Britain and that they would permit the construction of railway lines or roads in the Khyber region passes. In return, the British would resume paying monthly allowances to the tribal chiefs for maintaining the agreement. 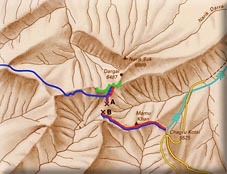 It was agreed that the Khyber Rifles under British officership would control the Khyber Pass itself to facilitate the movement of peoples and goods. Despite these terms, the campaign had not been an unqualified success. Queen Victoria herself wondered if the raising of Field Forces to subdue the area was the most effective policy when she stated in a letter to the Viceroy of India: 'As we did not wish to retain any part of the country, is the continuation and indefinite prolongation of these punitive expeditions really justifiable at the cost of many valuable lives?' Indeed, the Great Game had not yet ended and British nervousness about the security of Asia being disturbed from the North West Frontier remained a constant for many more years. The Tirah Field Force represented one of the last (but not 'the' last) Expeditions. It had discovered that the hit and run guerilla tactics of the tribesmen was being augmented by cheaper and better quality breech loading rifles being available. The British no longer had the undisputed advantage of weaponry and the terrain of the North West Frontier was conducive to helping the irregular tactics of the tribesmen. Far from resolving the instability of the region, the Tirah campaign demonstrated to all that it was likely to remain unstable for a long time to come. The Campaign In Tirah 1897-1898 An Account Of The Expedition Against The Orakzais And Afridis Under General Sir William Lockhart, G.C.B., K.C.S.I. Tirah: photographic journalism A photograph album from the Black and White War Album: No. 3 The Tirah Campaign published 1899.